Proform 505 CST Treadmill Review-Uncensored! Just got off from the review of the Proform ZT series and I decided to look more into some of the Proform Treadmill products and there was no one I could pick at the time of writing this review but the Proform 505 CST Treadmill. This unit supports 325pounds weight capacity and has an incline of 10 percent. 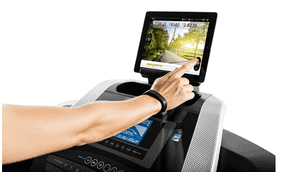 It has a maximum speed of 10 MPH, whereas the backlit display is about 6’’ that displays all the workout data and stats. All of these and much more at a very affordable price; I understand it was sold at $1000 back in 2014 when it was first introduced to the market but it is pretty much sold at a very cheaper price at Amazon. If you check and found all these things satisfactory, then chances are you will enjoy the equipment; nevertheless, you must also look at the other features such as the incline and the maximum speed to determine if it suits you. Motor– Just like most of Proform recent products, this unit comes with a 2.5 CHP Mach Z commercial motor, which is a good thing because the motor has the ability to handle any kind of workout you may use it for. However, its maximum speed as I said earlier is about 10 MPH. 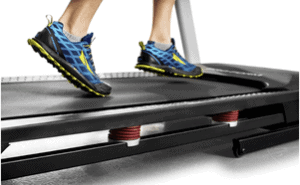 Tread Belt– This is another important aspect of any treadmill because this determines how roomy the treadmill deck would be. The roomy deck is usually great for taller individuals and running folks because they will be able to have their strides stretched out properly. And so, the dimensions of this unit are 20’’ width by 55’’ length. Professionals have different views as to if these dimensions are great for runners and tall individuals. Some say it is OK, while some argue that it is not. Frame– Usually frames are made up of steel or Aluminum but this one is made up of steel that explains why it has a lifetime warranty. Cushioning System-This Yet another very important aspect in a treadmill because this will take care of the stress that is being meted on the feet, knees, hips, and ankles, With a very good cushioning system such as this (because it has a ProShox Cushioning system) user will feel less stress on these areas I mentioned and also stand the chance of quick recovery from workouts. Space Saver– Due to its ability to fold this unit can be stored in almost anywhere in your apartment and has wheels that could make transportation a lot easier. 10 % Incline– User could use the incline up to 10% to challenge himself for quick results, even though I think it could have been better if it had more than 10% incline, but still good for the price, though. 18 Workout Apps– It comes with preset workout apps that were designed by a certified personal trainer and done to help you achieve your goals. iFit Compactable– You can use this feature to draw your route and use Google map to track your walking, jogging or running throughout the world. 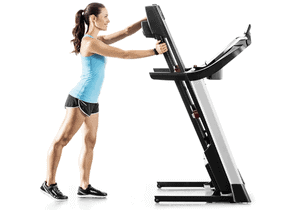 iPod Compactable– You can be rest assured to be listening to music while working out, and this actually makes the workout a lot more fun and easier. Just plug in your iPod into the port that was made available on this unit and you will have an endless stream of music. EKG Heart Rate Monitor– The heart rate monitor allows you to read your heart rate and view the data on the backlit display. To read your heart rate you must at all times be holding the handlebars that have the sensors on them otherwise the equipment will not be able to read your heart rate. Warranty– The frame is protected by a lifetime warranty, 25 years motor warranty, and 1 year and labor warranty. It has no chest strap heart rate monitor which will require you to be holding the handlebars all the time if you want to know your heart rate while working out. The preset workout apps, in my opinion, should have to be more. The incline is also not good compared to other treadmills of the same level. 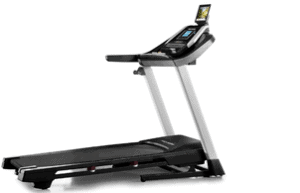 This is good buy however, I will suggest you go for Proform Pro 1000 Treadmill because they are almost the same in terms of the price, but the latter has way more features than the former. 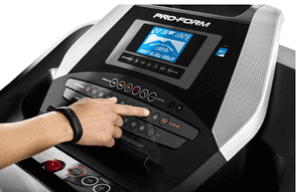 For instance, the Proform Pro 1000 has 22 preset workout apps against 18 for Proform 505 CST Treadmill. The Proform Pro 1000 Treadmill has a 3.0 CHP Mach Z commercial motor against 2.5 CPH for Proform 505 CST Treadmill. Just click here to read the review for Proform Pro 1000 Treadmill; that will help you to decide on which one to purchase. I hope this review helps, feel free to drop your comment in the comment box below. Thank you for this review! I am looking into a new treadmill and this was very helpful! I will take all of your thoughts into consideration. I have bookmarked your webpage. Thanks again! Thank you Katie, and if you have any question please feel free to ask. This looks like a pretty solid treadmill. I like the fact that it folds up; I’m sure that will make it very easy to move from one place to another. For single people like me who often move apartments, this is an important feature. I like the price too. However, I will also check out that other one you mentioned that you recommend. Thanks for the visit Ben, and sure it is very easy to move because of its ability to fold plus the wheels too. Thanks for this review Nnamdi. I am actually in the market for a treadmill so you have given me some very important information to look out for. I might just go and check out the Proform Pro 1000 as you suggest. Hello Andrew, thank you for the visit and I am glad I was able to help you make a choice.